The Three Sisters are Henry VII‘s daughters (and Henry VIII’s elder and younger sister respectively), Margaret and Mary Tudor, and their sister in law (Henry VIII’s first wife), Katherine of Aragon. These three women are also Queens – Margaret, married young to James IV of Scotland with the hope of establishing peace between the two nations, is the main voice of the novel. 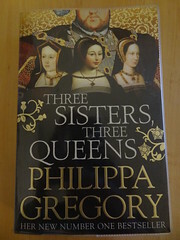 She moves from envy to pity for Catherine of Aragon, Queen of England by virtue of her marriage to Henry VIII, and is eternally irritated by her prettier, younger sister, Mary, Queen of France for three brief months following her marriage to Louis XII of France.